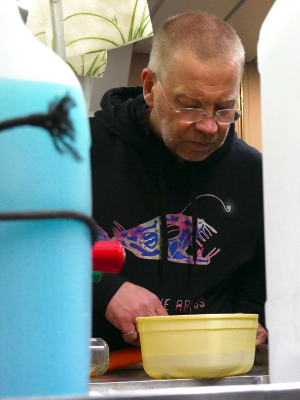 Jelly and fangs, is how our voyage chief scientist, Tim O'Hara, describes life in the abyss. But how do the fangs (some of the most impressive and terrifying in the animal kingdom) find the jellies and other soft-bodied and delicious animals, without the guiding light of the sun? The answer is, many of them create their own guiding lights, and like moths to a flame the animals come, but woe to those that draw too near. 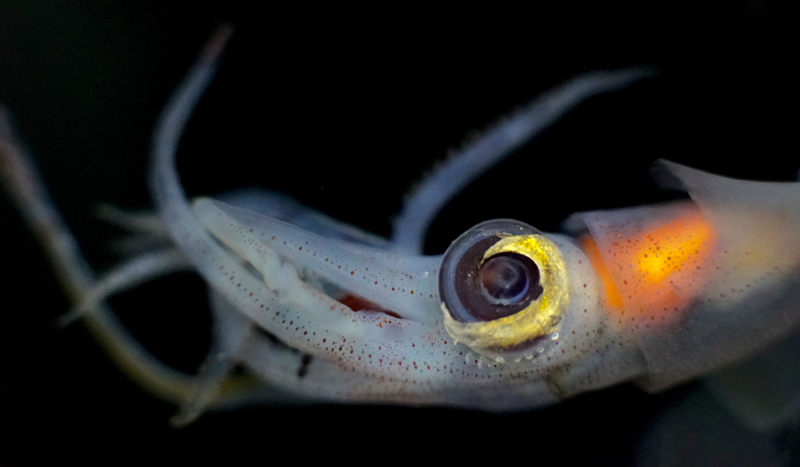 One scientist onboard the RV Investigator, Jérôme Mallefet from the University of Louvain in Belgium, has made it his business to find and photograph these living light bulbs. Below 1000 metres in the ocean it is completely dark, apart from lights generated by bioluminescent organisms. Many denizens of the deep undertake a migration every night to feed at the surface, now only bathed in the benign light of the moon and stars. It is on this journey, towards the light above, that an unwary traveler might mistake the bioluminescent light of the aptly named 'dragon fish', with the safety of the stars above. Much like a glow-stick, bioluminescence is a light-producing chemical reaction that takes place within an organism's body. In the twilight zone around 200-1000 m, blue light is the only light that is still present from the full spectrum of the surface world. Most fish here have lost the ability to percieve many other types of light, such as red light. Vivid reds are common colours among many deep sea crustaceans, because in the darkness they are invisible, or so they think. 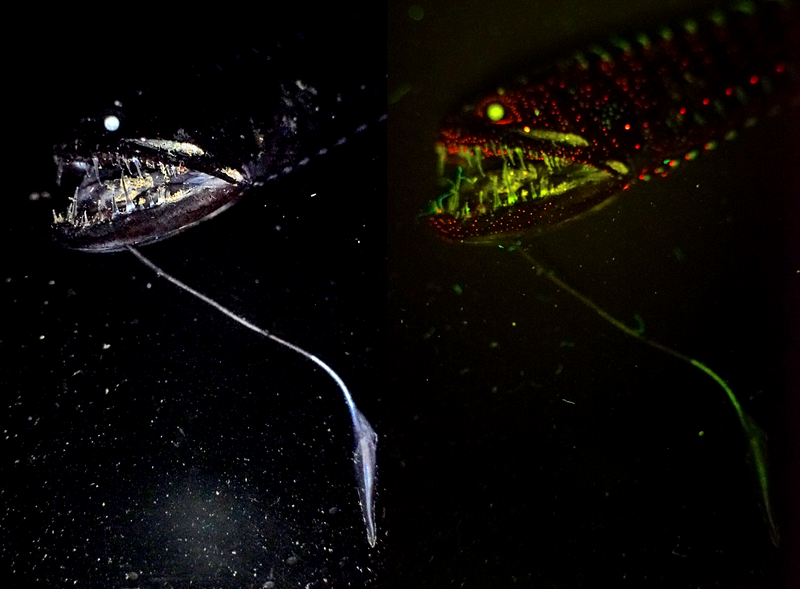 One species of dragon fish (Malacosteus, the red dragon fish) has the ability to produce red light, and shine it ahead, like a spotlight (or deathray!) in the gloom. It has also regained the ability to detect red light in an entirely red-light-free environment, illuminating the otherwise invisible creatures of the twilight world. 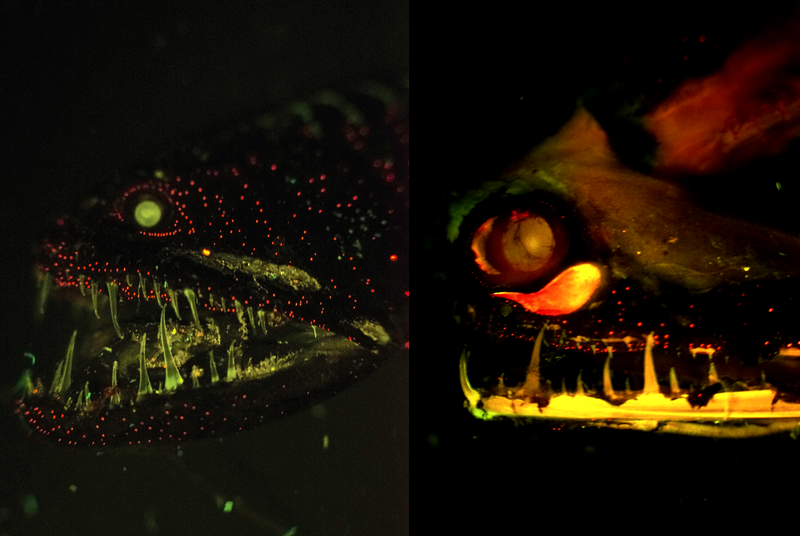 Crustaceans beware when the dragon fish, with its rows of needle like teeth, shines its red light of death upon you. Click here, or on the ship locator link to see the voyage track. Let your work bear fruit! Ménage toi quand même mon Frère car les années avancent et dormir est utile voir nécessaire.